Alcune fonti attribuiscono la data di nascita di questa scarpa di André Perugia al 1952, ma qui per (nostra) convenienza celebriamo il 60° anniversario della presentazione per il mercato americano avvenuta a metà novembre del 1953 per Saks Fifth Avenue. 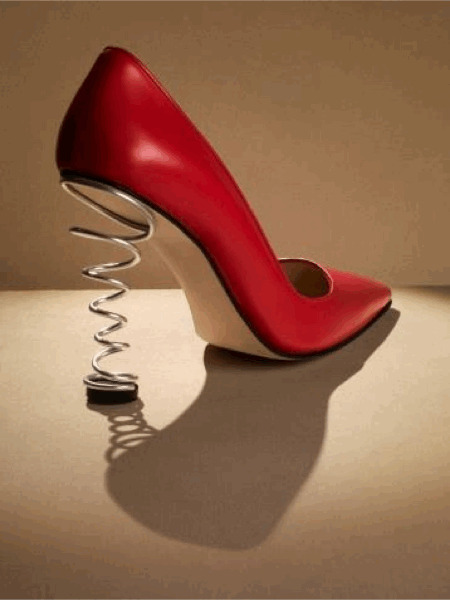 SPRING IN YOUR STEP (all'incirca "una molla per la tua camminata") era il titolo ricorrente (claim, in italiano) e l'accento veniva posto sia sull'innovativa forma del tacco che sull'utilizzo di acciaio nichelato (color oro), quindi resistente alla corrosione. La scarpa apparteneva ad una collezione caratterizzata dal supporto plantare metallico di cui il "sandalo cubista" é forse il modello più conosciuto. 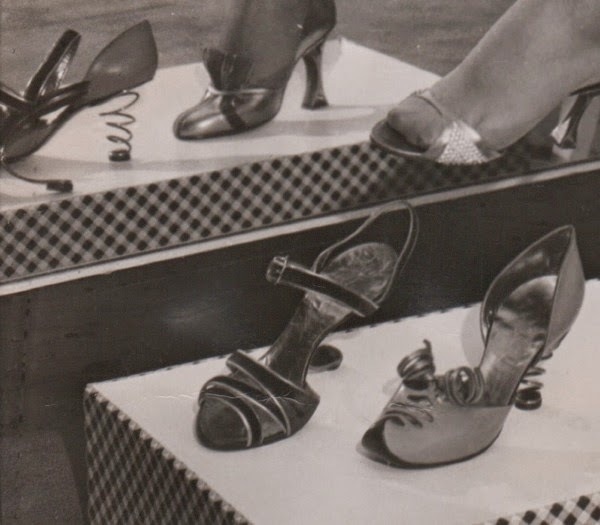 Some sources date this André Perugia shoe from 1952, here however we celebrate the 60th anniversary of the American showcase at Saks Fith Avenue (mid November 1953). 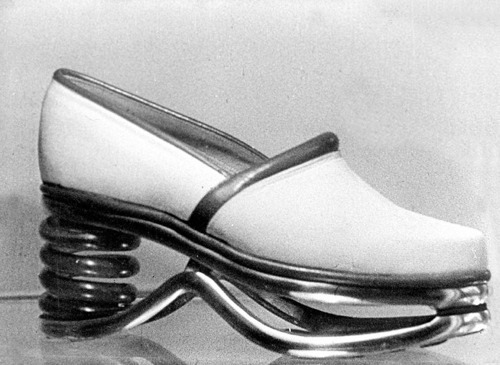 The claim was SPRING IN YOUR STEP and the emphasis both on the heel design and the material used for it (gilded nickel stainless steel). 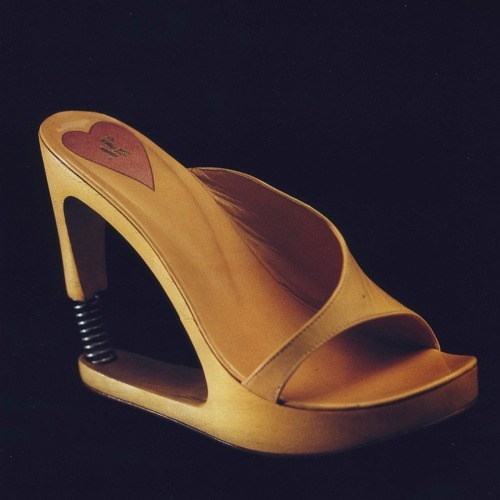 The pump was part of a metal-shanked collection of which the "cubist sandal" is the most celebrated model. 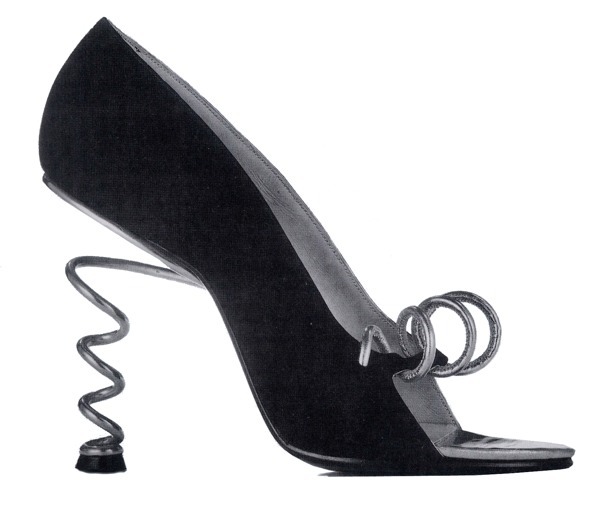 The corkscrew heel in 1953 was pure genius but it comes with g r e a t surprise to learn that Perugia fashioned that heel seventeen (17) years before. 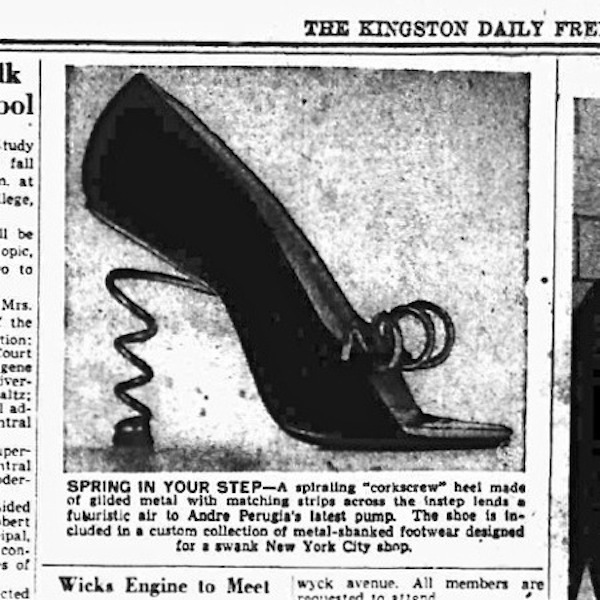 Mary Palermo, a Chicago model, is shown above at style review at which evening slippers made of metal that are fashioned to remove the wearers weight from the arch to the heel and ball of the feet, designed by André Perugia of Paris, were exhibited. 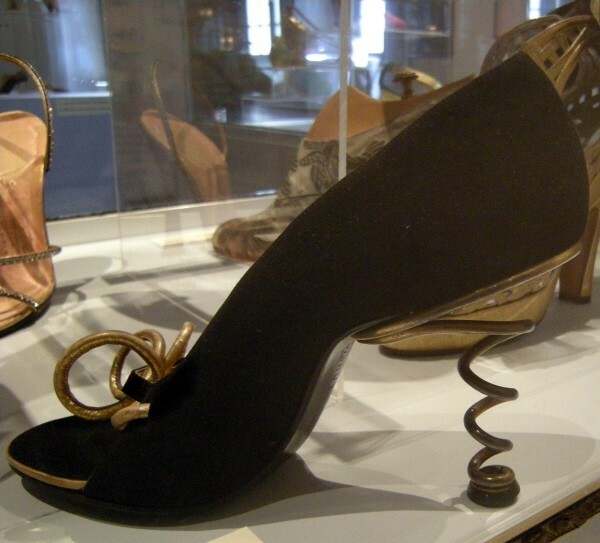 A modernistic sandal with rocking-chair heel and a Chinese mule with corkscrew heel are shown left to right on floor, while Miss Palermo wears a gilt metal slipper with split heel and clamp, on her left foot, and another model with split metal heel on her right foot. 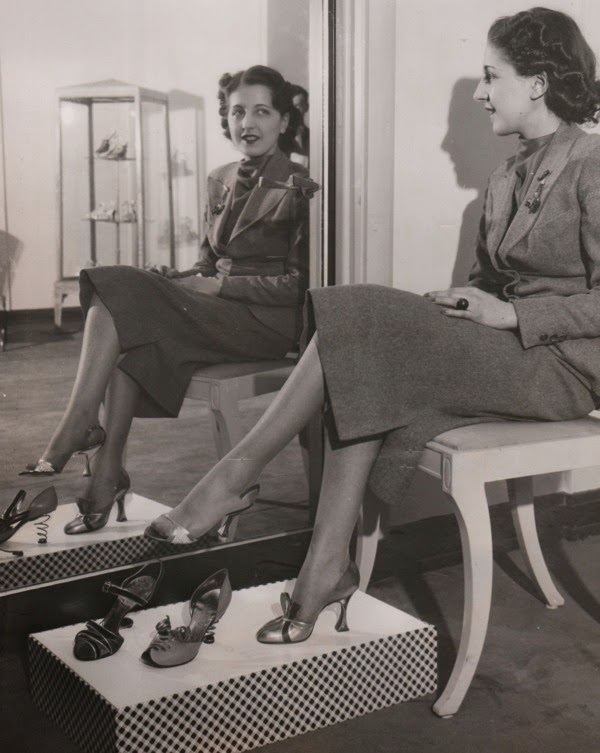 A huge thank-you-note goes to Shoe Icons' Nazim Mustafaev who found the pictures from 1936 and send them our way knowing we're interested in all things Perugia. And finally, the following picture can be found on the net without credits and various degrees of comments. Looks like a replica but we can't comment further on.